There’s more than one way to skin a cartridge. 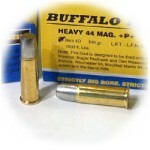 I was prompted to do so because I had picked up some new Buffalo Bore ammunition that I wanted to try. And I was VERY impressed with the performance of that ammunition, since it generated over 1653 fps/2063 ft-lbs out of my Winchester 94. However, there was a problem: it wouldn’t feed in my levergun. Oh, it shot and extracted just fine, but you couldn’t rack a new cartridge from the magazine into the chamber — they would invariably get stuck. Thus making the gun a single-shot, at least as far as that particular ammo was concerned. So I started thinking about ways around this problem. My first thought was that perhaps I could develop a similar cartridge using a .44special case. I knew the history of the development of the .44magnum, so i figured that it was probable that the .44special brass would withstand the pressures involved, and give me about 1/8th inch (the difference between the case length of the .44special and the .44magnum) to play with. I found a suitable bullet, and did a little research to see whether anyone had recently tried to develop such power out of a .44special case. My research pointed to the possibility of developing full .44magnum power out of a .44special case (which was what was done historically, so no big surprise there). 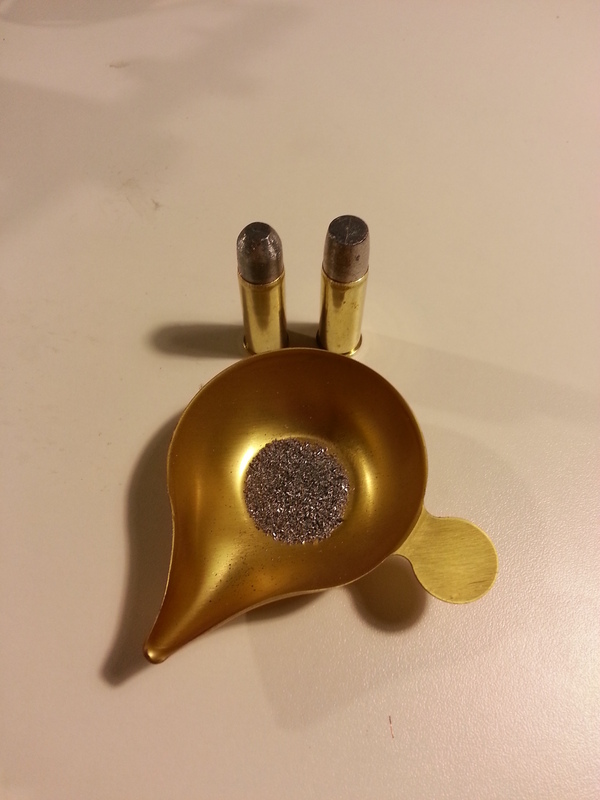 And over the course of the last month I worked up two different flights of test ammo experimenting with that idea. What results did I get? Well, let’s just say that you can indeed get some very powerful rounds using .44special cases. Indeed, using 240 grain bullets (which are fairly standard for the .44) I had considerable success. The rest of the equation is left to the experienced reloader to determine for themselves. With the 330 grain bullets, though, it was a different story. When approaching the upper end of the published data for .44magnum, I started to see indications of stress on the spent brass which made me … nervous. Enough so that I decided not to risk shooting the last couple of test rounds. Draw your own conclusions. And the chronographed power results were only about half of what the Buffalo Bore ammunition I was trying to emulate demonstrated. Hmm. Now, it is possible that with a different type of gunpowder, I might be able to come to a different result with my shorter .44special reloads. Maybe. But we all know how hard it can be to find preferred types of gunpowder these days. So I decided to reconsider my strategy. After all, what I wanted was to have the power of the Buffalo Bore loads, but in a cartridge which would feed reliably in my levergun. Note the rounded cartridge on the left, next to an unaltered cartridge on the right. In the pan for my balance beam scale you can see the bulk of the lead removed from the bullet in the cartridge on the left. Now, that’s not all of the lead I removed — but it is probably the vast majority of it, since I did the removal over a sheet of paper using a rasp, and then weighed the shavings (which turned out to be 10.5 grains, btw). But I also think I’ll drop Buffalo Bore a note, and see if I can get them to tweak the design of the bullet just a tad to make it more friendly for us levergun owners. Thanks to BBTI, I should have enough cred that perhaps they’ll take note. Now I know why you were using the special case instead of the magnum. No room in the case to seat deeper? Or do a combination of trimming mag case, deeper seat and bullet reshaping. I wonder if trimmed 445 super mag case is stronger? Any and all of those questions/comments/suggestions are good, and probably some combination would work. But I was looking for a relatively simple solution that would be suitable for most people without a lot of technical knowledge or tools. A rasp/file and some sandpaper is a whole lot easier than a bunch of reloading equipment, so I should have thought of this approach first. Better even, would be Buffalo Bore to do a slight modification on their end. If this was the case, you would know that Elmer Keith chose the parent case for the .44 mag to be the .45 long colt, NOT the .44 special, because the case wall is thicker on the .45lc. Your link to Wikipedia: Wiki is WRONG. Read Keith’s own writings on the development of the round for the definitive source. You know, the good thing about Wikipedia is that you can correct wrong information, if you want to and can support your changes. Please feel free.